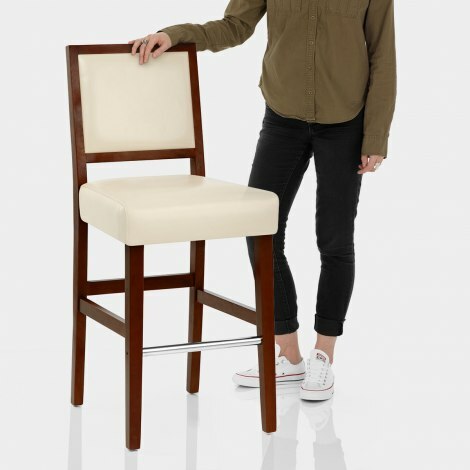 Atlantic Shopping invites you to discover the joys of the Jasper Leather Bar Stool Walnut & Cream. Representing a beautiful fusion of old and new, the Jasper is a delight to look at and it's guaranteed to impress with its timeless and traditional appeal. The authentic cream bonded leather seat matches the backrest pad, with each component imparting a cushioned effect and contrasting with the dark frame. Further to this, the solid wooden frame is lent an intriguing look as a result of its walnut finish. A crisp chrome bracing bar strengthens the structure while the Jasper's integration of protective floor plugs means you can use it across a range of surfaces with ease. "A real class act with extreme comfort"
Good helpful service over phone and prompt delivery. Was a little worried about ordering a self assembly stool, but this one is well put together and very strong. Nice looking stool and comfortable to sit on. Add the great delivery time and an unbeatable combination. Very impressed with this stool. Really pleased with the bar stools, they look more expensive than they were and look really good in our new kitchen. Customer service was exceptional. Overall, would definitely recommend. Just put together these stools, assembly very easy. They were delivered so quickly and really well protected. They look amazing and very chic. Can't believe what a great price they were.